With fresh, Bacon Fat Tortillas, ready to go, it was time to kick a Mexican food craving in the rear and enjoy some home-made enchiladas. These guys were not even close to being a disappointment! Only bummer of the whole meal was not having enough Chile Powder to make this enchilada sauce correctly, regardless, a few extra shakes of Cayenne Pepper and a short prayer were all that was needed to thoroughly enjoy this weeknight meal. Spread a bit of Enchilada Sauce on the bottom of a 9x13 pan (or have two square pans ready to go) then begin filling each tortilla with a small handful of Onions (sauteed if that's your preference - we're not opposed to raw, so I left them that way), Cheese and a touch of Enchilada Sauce. 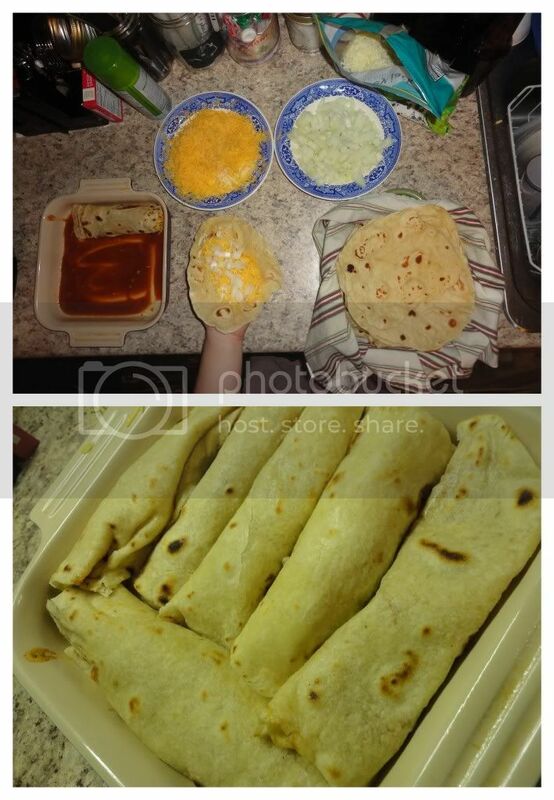 Arrange tortillas in the pan, once it's full spread remaining Enchilada Sauce over the top, sprinkle with cheese and bake at 350 for 30 minutes or until cheese is melty and sauce is bubbly. Enjoy!